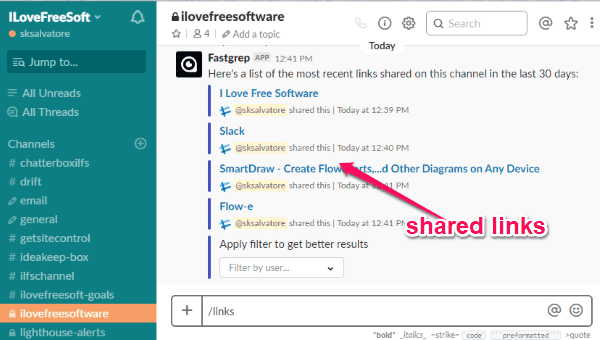 This tutorial will explain how to find links and files shared by any user on a Slack channel. This can be done via a free Slack app called “Fastgrep“. 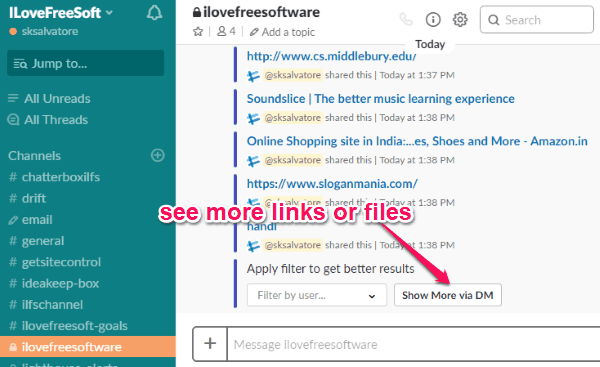 When your Slack account is integrated with this app, it will enable you to easily search for links and files shared by your team members on any channel you want. It can automatically generate and display a list of posts shared in the last 30 days on that channel. You can also manually specify the user, whose links or files you want to see. This free app is very easy to use, as you can do the above task just by executing some simple slash commands. You can type these commands either on the source channel directly or use the DM with this app. It will show you the links and files along with the username (who shared them) and the date & time. For that, simply go through the steps below. We have also covered some of the free tools to find your files scattered across multiple cloud accounts. Let’s start by going to the homepage of Fastgrep. On this page look for “Add to Slack” button and click it. Then this app can be integrated with your Slack account. Then you can go ahead and invite this Slack app to any channel on which you want to find the links and files shared by any user. 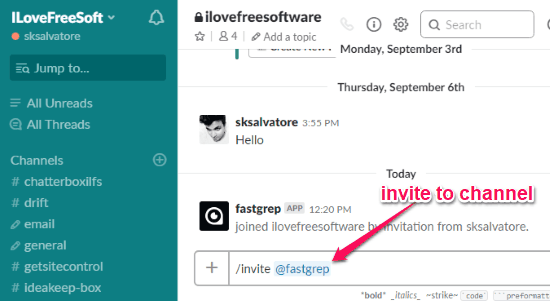 To do that, open the channel and type “/invite @fastgrep” in the message field and execute the command. After you do that, you’re all set to find links and files shared by any of our team members in the past 30 days on that channel. For finding links, you would need to simply enter the “/links” command and press Enter. As soon as you do that, it will automatically scan through the entire channel and find the links for you. For each link, you will see who shared it and the date & time. At the bottom, you will also see an option to filter the search result by users. For that, click on the drop-down menu and then you will see the list of users from where you can choose any user you want. As soon as you do that, it will filter the links shared by that specific user only. Do note that, when you search for links and files in a channel, it will show you the 10 most recent posts. But, if there are more than 10 posts containing a link or file, then you can see them all on the “Direct messages” section. For that, when you execute the “/links” or “/files” command, it will show you an additional option “Show More via DM” at the bottom of the links or files list. Simply, click on this option and the entire list of links or files will appear on the DM by “Fastgrep”. 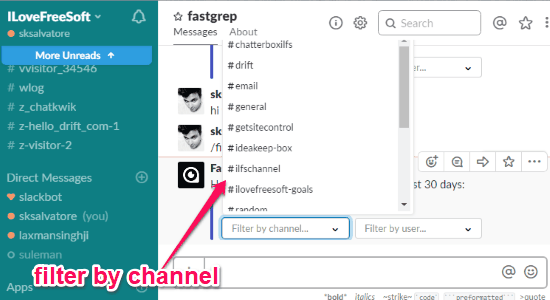 When you’re viewing the links or files in the DM, you will see an additional option to filter the posts by channel. You can choose any channel you want and then it will curate the list accordingly. 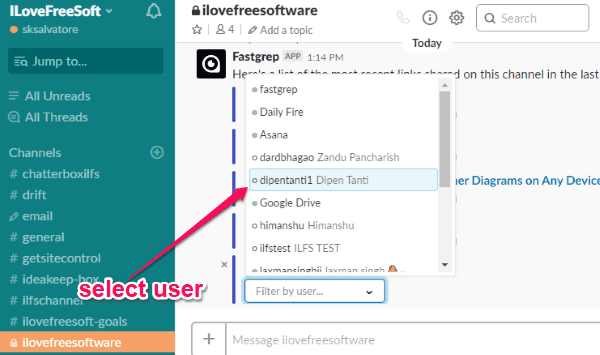 This way you can easily find links and files shared by any user on a Slack channel. 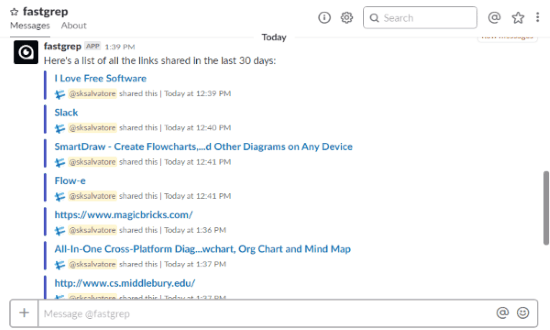 You can now easily search for all the links and files shared on any Slack channel in the last 30 days. The best feature is that it allows you to filter the posts by specific users. Go ahead and try “Fastgrep” out.